SCVHistory.com LW3294 | Melody Ranch | Monogram Rough Riders in 'Forbidden Trail,' 1941. 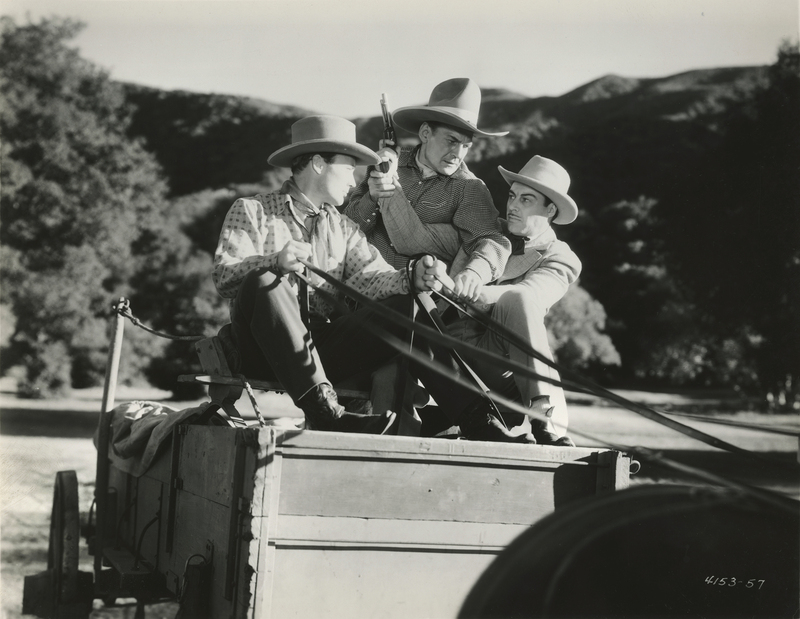 Buck Jones (center) tries to stop gang leader Tris Coffin (as Ed Norton) as they ride through Placerita Canyon in "Forbidden Trail" (aka "Forbidden Trails"), a Christmas 1941 release from Monogram Pictures starring the Rough Riders — Jones, Tim McCoy and Raymond Hatton. 8x10 publicity photograph. Director Robert N. Bradbury makes thorough use of Placerita Canyon, with location filming at the Mongram Ranch (later called Melody Ranch) as well as the Walker Ranch and Andy Jauregui Ranch. Ernie Hickson, then-owner of the Monogram (aka Placeritos) Ranch, is credited as technical director; he would have been the set designer and prop master. Scott Dunlap is producer, which means Harry Neumann is cinematographer. In the 1940s, when the box-office appeal of the big stars of the 1920s and 1930s such as Hoot Gibson and Buck Jones began to fade as their original audiences aged and outgrew them, Monogram producer Scott Dunlap teamed them up in dozens of in low-budget ("B" Western) "buddy pictures" in an attempt to triple the attraction. This is one such offering. "Forbidden Trail" also features Christine McIntyre, Dave O'Brien, Charles King, Bud Osborne, Lynton Brent, Jerry Sheldon and Jones' horse Silver. Uncredited cast members are Silver Tip Baker, Bob Burns, Jess Cavin, Rube Dalroy, Jack Evans, Herman Hack, Jack Kirk, Tom London, Kansas Moehring, Milburn Morante, Lew Morphy, Bill Nestell, Tex Palmer, Edward Peil Sr., Eddie Phillips, Hal Price, Marin Sais, Lee Shumway, Dan White and Frank Yaconelli, with stunt work by Wally West. LW3294: 9600 dpi jpeg from original photograph purchased 2018 by Leon Worden.